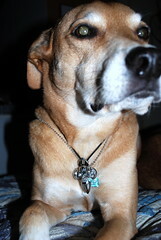 Rex is modeling two necklaces that I've been wearing lately. One is a silver skull pendant from Silverlust that a friend got for me from Scout's Honor's movie night and silent auction a few weeks ago. Which, by the way, was a very fun and successful event. 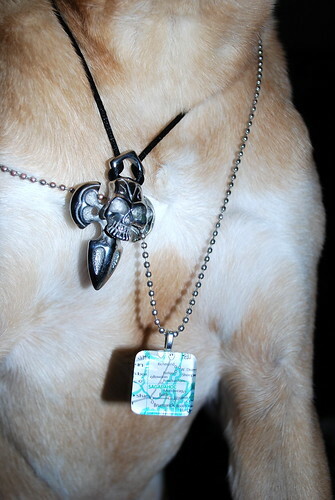 The other is a map tile pendant from my friend Kate's Etsy shop, Maine Days Designs. It's a tiny map of where I'm from in Maine, which I jokingly refer to as my "if lost, return to sender necklace."